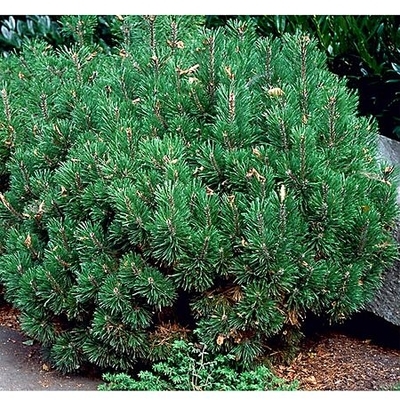 The Dwarf Swiss Mountain pine is similar to Pinus mugho mughus but much smaller in growth. It is also a slow-growing variety, but reaches only 3 to 5 feet tall and 6 to 8 feet wide. Its needles are only 1″ in length and usually appear darker in color than the larger size tree. They make an excellent specimen tree but also look great in small groupings or in containers. They may be pruned in spring to maintain a dwarf shrub-like form.